Every month Spud want's something different out of his pocket money, it may be a new game, or a dvd, or something to play in the garden with now we've got a house, but for so many years there has always been one thing on the top of Spud's wish list and that was a puppy. I promised Spud, that if we ever got a house, I would get him a puppy, and then last year we did get a house, but it was a month before Christmas and to do the house up it was going to be a costly next few months, I wasn't sure when I could afford to buy him a puppy to be honest! However back in March for Spud's birthday I purchased him a puppy dog who he called Jezeppi, I scrimped and saved every penny I could after Christmas and paid £300 for our pup alone, then the cost of his injections and all the items he needed was another small fortune on top! Having our own puppy for the first time has taught us lots of things, like for example - stair gates aren't just for babies, but there for puppies and dogs too! Every time the front door opens, Jezeppi think it's okay to dart off into our front garden, it wouldn't be so bad if we was enclosed with a fence and gate, but we aren't, and with the doors that don't close properly, there was no way of putting him into another room quickly, so I had no other choice but to buy a stair gate recently and put our not so little puppy anymore on the stairs if someone was coming into the house or leaving. 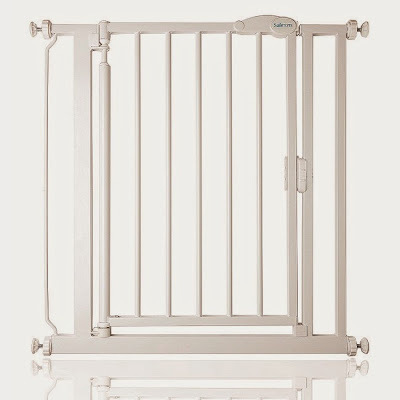 I was approached recently by Safetots to do a review for one of their stair gates, but as we have literally just purchased one in the last week, and have no other use for one, I've been given permission to kindly host a giveaway for the stair gate instead, giving one of you lucky readers/visitors the chance to win a Safetots Self Closing Stair Gate in white worth £27.99 as pictured above. To be in with the chance of winning, enter your details via the Rafflecopter form below!